Stories take odd turns before becoming whole. “The Swamps of Jersey,” the first Frank Nagler Mystery to be published, was a rewrite of an old version of “A Game Called Dead,” the second Nagler mystery to be published. But one day in JFK Park in Dover, SWAMPS changed from a simple cop-and-robber tale into the complex political-murder tale it ended up. This is how it got there: I was working as a local reporter for the Daily Record and had just finished a sidewalk conversation with the mayor, who sort of yelled at me for questioning the economic progress of the old town. A couple days later I was sitting in the park and took a look around. Homes were being repaired, traffic was jammed as always, a mural was being painted, a playground being painted. There was something going on. But it wasn’t my voice, but that of a woman, who in the Frank Nagler books became Lauren Fox, in a way the quiet hero of the series. That phrase opened the door to change to story. “Nagler was sitting in the gazebo in the center of the park. He and Lauren would have lunch here a couple of days a week in the warmer seasons. The shade, the noise of traffic and happy children was like a shield against the troubles that swirled through the town. They’d spread their lunch out on the bench that rimmed the outside of the shell and just take in the sounds, the scenes, sometimes talked, sometimes not. The old warehouse that formed the park’s western border was receiving a colorful mural that told Ironton’s history in bright wide swirls of blue and green, yellow and brown paint. Two students were outlining a wooden canal boat being hauled through town by a mule, and another splashed black and gray paint to bring to life a steam engine resting at the town’s Nineteenth Century station against a faint background of reddish factories and tall smoke stacks. Nagler recalled that he looked at her sharply after she said that. Left the old troubles behind. It didn’t seem to him that she was talking about the city. He started to ask her what she meant, when she stood and said, “Time to go. Lunch is over. Thank you, sir.” Two weeks later when she disappeared, he knew that had been a conversation as scripted and planned as any speech in a play. It had indeed been time to go. …. She looked away from the scene a moment and out into the street. Then she turned and found his face at the back of the crowd and he started to smile back. But she wasn’t smiling. Her face was filled with a hurt he didn’t understand. The ceremony had begun and she intently paid attention to the speakers. But her eyes were dark and while she tried to show a pleasant, interested face to the crowd, Nagler could see it was just an act. The veneer was soft, but it was a face of hurt and anger, and from where he stood, Frank Nagler knew it was aimed at him. He just did not know why. The sounds of the playground and the street returned. He could still see her on that podium, still see her torn face. Oh, Lauren. Oh, sweet girl. What did I do? Find her, Jimmy? She was right in front of me and I couldn’t find her. Spill me out of this twirling gyre, let my feet find ground. Stop the noise in my head, hide the flashing pictures; let the spinning end. He leaned forward and covered his eyes with his hands and inhaled deeply and exhaled slowly. That old feeling came back, the one that left a hole inside him, loneliness returned. He sat up and glanced around. The invisible sheen, like a plastic wall, was back. He was on the inside and everyone else was on the outside. Stay there, he thought. Never again. 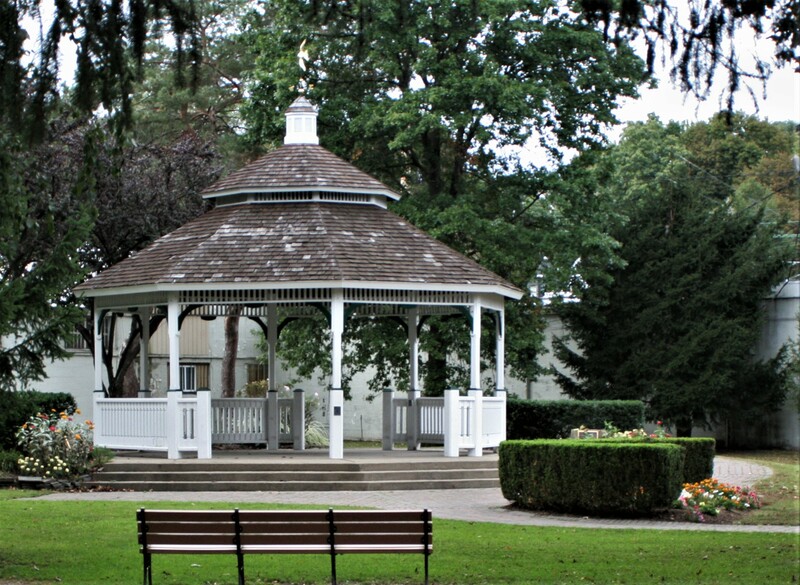 He saw Lauren stand on the podium and then saw her sitting on the bench inside the gazebo. “Nothing is simple, Frank,” she said as she picked up the food wrappers. “Nothing is at it seems. There’s more here than meets the eye.” Then she winked. Nagler smiled, and then shook his head. That’s what she had written on that sticky note in the packet she left in her apartment freezer. There’s more than meets the eye. Did she mean us? All those feelings kept to ourselves, how we justify our hurt later with indifference? Or had she meant there, in the park? She’d known he’d come back here. Am I that easy to read? That easy to fool? One by one he examined each section and piece of equipment in the park. The bandstand was old, maybe seventy-five years, the war memorial dated back to after World War I. Brick (Ocean County Library System) Mountainside; Morris County Library; Somerset County Library System; Bernardsville Public Library; Hunterdon County Public Library; Mount Olive Public Library; Phillipsburg; Warren County, Franklin branch; Mount Arlington; Wharton; Dover; Hackettstown; Clark, Parsippany and the Ramsey library, as part of the Bergen County Cooperative Library System; The Palmer (Pa.) Branch of the Easton Public Library; Deptford Free Public Library and Franklin Township Library (Gloucester Co.), New Providence Memorial Library. This entry was posted in BooksNJ2017, Fiction, Greater Lehigh Valley Writer's Group, Hot in Hunterdon; Georjean Trinkle, Imzadi Publishing LLC, Michael Stephen Daigle, Mystery Writers of America, Sally Ember, www.michaelstephendaigle.com and tagged "A Game Called Dead", "The Swamps of Jersey" Imzadi Publishing, "The Weight of Living", Dover, Fiction, Frank Nagler, Ironton, Morris County, New Jersey. Bookmark the permalink.